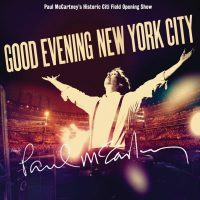 Paul McCartney's seventh post-Beatles live album was a CD/DVD set recorded over three nights at New York's Citi Field. More than 180,000 tickets were sold for the concerts just hours after the shows were announced. McCartney was the first musician to perform at the Citi Field stadium, home to the New York Mets baseball team. Citi Field was the successor to Shea Stadium, where The Beatles gave two triumphant concerts in 1965 and 1966. The final musician to perform at Shea Stadium prior to its 2008 demolition had been Billy Joel. McCartney joined him on that night, and Joel returned the favour for the 17 July 2009 show. Together they performed I Saw Her Standing There. The three July 2009 performances were filmed in high definition using 15 cameras, and directed by Paul Becher. The final edit also included footage from 75 flipcams which were handed out to fans at the shows. The audio was mixed in stereo and 5.1 surround sound by The Beatles' former engineer Geoff Emerick, and Paul Hicks, who had previously worked on the 2009 Beatles remasters, the Anthology project, Love and Let It Be... Naked. Good Evening New York City was issued in three-disc and four-disc versions. The first was a standard edition containing two CDs and a DVD, whereas the deluxe version contained expanded packaging and a bonus DVD of McCartney's 15 July 2009 performance on the Ed Sullivan Theater marquee, recorded for The Late Show with David Letterman. The bonus DVD lasts for 47 minutes, and features the songs Get Back, Sing The Changes, Coming Up, Band On The Run, Let Me Roll It, Helter Skelter and Back In The USSR. There is also an audience documentary film titled Good Evening People, and a full Citi Field performance of I'm Down. The Citi Field performances of Sing The Changes, Jet and Band On The Run were also released as downloadable content for the Rock Band video game on 5 January 2010. Good Evening New York City peaked at number 28 in the UK albums chart, and at 16 on the US Billboard 200. It was a top 10 hit in Norway, but failed to chart highly elsewhere. The recording of Helter Skelter from the album won in the category of Best Solo Rock Vocal Performance. At the 53rd Grammy Awards, held at the Staples Center in Los Angeles on 13 February 2011, the recording of Helter Skelter from the album won in the category of Best Solo Rock Vocal Performance.